Thanks to a couple of Foreign Language Assistance Program (FLAP) grants I was very fortunate to be able to build K-12 language continuums. Working in the 21st largest district in the country, providing a meaningful language experience for all students in all 125 elementary schools was out of reach. I was however, able to build a LCTL and a Spanish K-12 language feeder pattern in each region of the district. This work was some of the most coordinated work toward proficiency I was able to do. Working with these new teachers who were eager to learn as much as they could, their energy was infectious. I was able to work with the best, my dream team and as we grew the teachers and the programs their creativity flourished. In our third year I formed a leadership team with representation from each language. These teachers met weekly and the synergy was inspiring to say the least. As we struggled to make proficiency meaningful and important to our youngest language learners these creative geniuses had the answer. Borrowing from video game language to describe moving through levels (i.e. leveling up) and an icon that most children enjoy (ice cream) we created the ice cream proficiency tracker. We introduced the concept to our third through fifth grade students that spring. Working with them to understand the levels and what they looked like and how it could help their language learning. We piloted activities that allowed students to identify the performance level of sample writing and speaking passages, allowed students to act out performance levels, and oriented students to the new performance aligned rubrics. Now, my teachers begin the school year for all students in grades 2-5 with a pre-unit that welcomes students to the language class, teaches rules and procedures, and for the first time explains proficiency & performance via the ice cream cone! This has become a universal activity. Every teacher in every language across the district begins school with this pre-unit. Much of it is taught in English with exception to the rules and procedures and introductory language expressions needed to facilitate class (such as greetings, or asking for permission). Teachers implement activities that we previously piloted for students to practice identifying performance levels, allowing students to act out performance levels and finally to set goals for their own performance. Students get excited about understanding what is possible and that meeting their goals is up to them. That level of engagement was a little surprising to be honest. Teachers work systematically to reinforce the performance targets and to push students to challenge themselves. Using a unit performance tracker, each unit assessment allows students to color the scoop of the cone that their performance demonstrated. 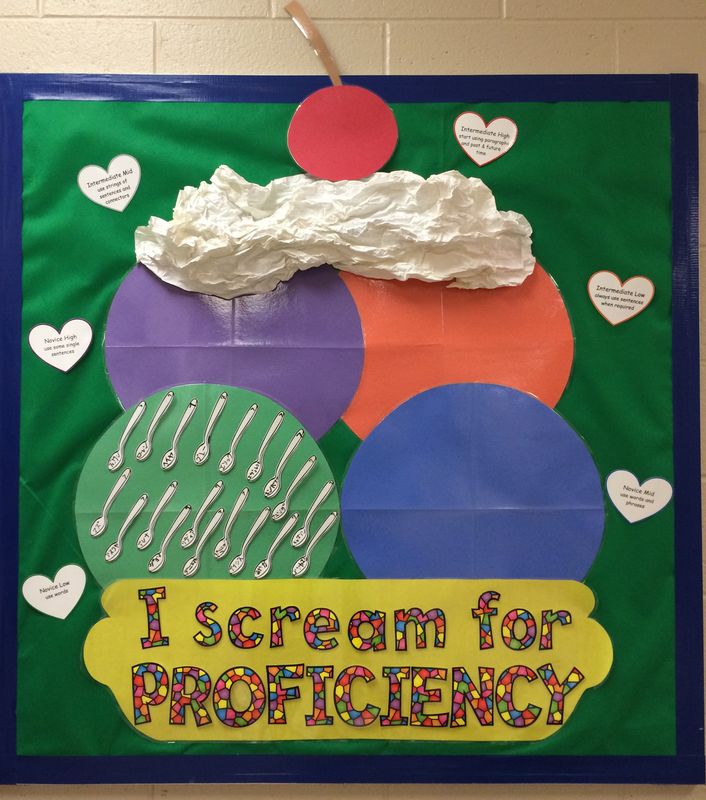 Many teachers create performance tracker bulletin boards as well keep students motivated. I even witnessed teachers working the performance goal into their opening routine. To set the tone in each class session, teachers share the learning target, the daily agenda of major activities as usual and finally a reminder of the performance target and what that looked like. What a great opportunity to allow students to share the performance target and a description of what that looked like. The more teachers integrate the ice cream cone into their classroom the more it becomes a cornerstone of instruction. Teachers integrate ice cream cone trackers for annual goal setting as well as quarterly monitoring all contained within their interactive notebooks. We are beginning to see elementary classroom teachers and administrators talking with students about which scoop the students had achieved to date, what that means and what their goals are. The students committed to the challenge of “leveling up” the ice cream cone and were progressing in their performances in a way we had never experienced previously. Suddenly, peer feedback in our elementary program is not just possible but it is flourishing. Students are giving each other feedback in ways that we had not previously thought possible. Several schools saw parents and PTA groups join in celebrating the end of the year with ice cream parties and school wide bulletin boards of ice cream sundaes with students names on it. The experiences parents or teachers had had in their language classrooms in no way resembled the experiences their students were receiving. Another exciting outcome of talking about language earning is the reinforcement of the metacognitive skills students are developing in other content areas. This focus on performance monitoring and peer or self assessing is a powerful reinforcement of core content skills that are applicable in any of the other subjects. Any time we can honor our content and skills development while reinforcing core content or skills it is a win! It builds support school wide for language learning which is critical to all of our success. What may have started as a small idea with a group of teachers is now one of our driving forces in the district. The ice cream cone performance tracker was the impetus for the path to proficiency many of my secondary teachers use. However, many also use the ice cream cone example with similar success. The creativity of this group of teachers that developed the ice cream cone metaphor mixed with video game terminology was the impetus for performance monitoring or tracking in the district. It is important to try new things and work collaboratively. The beauty of that leadership group was not just the creative genius they displayed in developing tools like this but in the growth their students exhibited. Second and third year teachers established themselves as instructional leaders, willing to wrestle with the hard projects and yielding an amazing synergy that promoted and documented student linguistic growth. 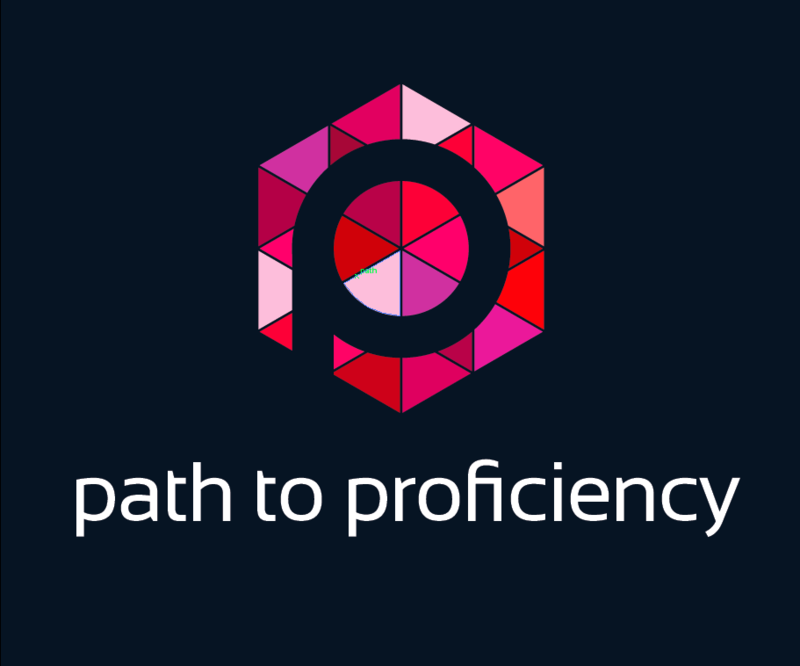 Talking about proficiency and performance with students is catching on too. Several teachers in other districts have shared how they are using similar visuals to support students in their classroom. Pingback: Musicuentos – How about an elementary rubric?